Not surprisingly, marijuana intoxication can cause distorted perceptions, impaired coordination, difficulty in thinking and problem solving, and problems with learning and memory. Research has shown that marijuana's adverse impact on learning and memory can last for days or weeks after the acute effects of the drug wear off. As a result, someone who smokes marijuana every day may be functioning at a suboptimal intellectual level all of the time. Numerous studies have shown marijuana smoke to contain carcinogens and to be an irritant to the lungs. In fact, marijuana smoke contains 50-70 percent more carcinogenic hydrocarbons than does tobacco smoke. Persons high on marijuana show the same lack of coordination on standard drunk driver tests as do people who have had too much to drink. There are several well known methods of using marijuana. 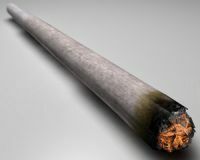 Most users roll loose marijuana into a cigarette called a "joint". Marijuana cigarettes contain more than 400 chemicals. One joint has up to four times as much cancer-causing tar as a regular filtered cigarette. Additionally, when an user smokes marijuana on a regular basis their body loses the ability to fight off infection. It can also increase the user's heart rate leading to frequent chest colds. Another one of the many well known methods of using marijuana is smoking it out of a water pipe called a "bong." The effects of smoking marijuana from a water pipe are felt within minutes, reach their peak in 10 to 30 minutes, and may linger for two or three hours. The effects experienced often depend upon the experience and expectations of the individual user as well as the activity of the drug itself. Low doses tend to induce a sense of well-being and a dreamy state of relaxation, which may be accompanied by a more vivid sense of sight, smell, taste, and hearing as well as by subtle alterations in thought formation and expression. This state of intoxication may not be noticeable to an observer. However, driving, occupational or household accidents may result from a distortion of time and space relationships and impaired coordination. Stronger doses of marijuana intensify reactions. The individual may experience shifting sensory imagery, rapidly fluctuating emotions, a flight of fragmentary thoughts with disturbed associations, an altered sense of self-identity, impaired memory, and a dulling of attention despite an illusion of heightened insight. High doses may result in image distortion, a loss of personal identity, vivid fantasies, and hallucinations. Other methods of using marijuana include mixing it into food and beverages. Some users mix marijuana into foods such as brownies, cakes or cookies. Others will brew it as a tea and then drink the beverage. Hash users either smoke the drug in a pipe or mix it with tobacco and smoke it as a cigarette. Lately, young people have a new method of using marijuana: they slice open cigars and replace the tobacco with marijuana, making what's called a "blunt." When the blunt is smoked with a 40 oz. bottle of malt liquor, it is called a "B-40." Marijuana cigarettes or blunts often include crack cocaine, a combination known by various street names, such as "primos" or "woolies." Joints and blunts often are dipped in PCP and are called "happy sticks," "wicky sticks," "love boat," or "tical." With so many methods of using marijuana, it is not surprising that marijuana is the most widely used illicit drug in the United States. According to the 2000 NHSDA, an estimated 14.0 million Americans were current (past month) marijuana users. This represents 6.3 percent of people aged 12 or older and 76 percent of current illicit drug users. Of all current illicit drug users, approximately 59 percent used only marijuana, 17 percent used marijuana and another illicit drug, and the remaining 24 percent used only an illicit drug other than marijuana in the past month.